SUPERIOR, Wis. — Some sports anglers have expressed frustration after Wisconsin officials and two tribes settled a new agreement for managing Lake Superior’s fishery, saying they were left out of negotiations. The Wisconsin DNR and the tribes approved the Lake Superior Fishing Agreement last month, saying the new terms will preserve and protect the Lake Superior fishery, Wisconsin Public Radio reported. The groups had been negotiating a new agreement for four years after the former contract expired in 2015. But Scott Bretting, president of the Apostle Islands Sports Fishermen’s Association, said sports anglers should’ve been included in the process. “It’s happened behind closed doors as a secret negotiation and then it rolls out with a handshake or a signed agreement between attorneys representing the DNR and the tribe,” Bretting said. The DNR served to represent the interests of state commercial fishers and sports anglers during the negotiations, according to officials. The department said the new agreement will also improve information sharing and reporting from all groups involved. But sport anglers have expressed concern that the new agreement puts more pressure on the fishery. The association is worried in particular about a new commercial whitefish season to be held in October. “That could devastate that fishery in a short period of time, and they have no quotas or any data for what they want to target for amount of take,” Bretting said. Scott Loomans, the department’s policy adviser, said the new whitefish season will be continuously evaluated and assessed. “We do not believe the new October season will have negative impacts to the Lake Superior fishery,” Loomans said. 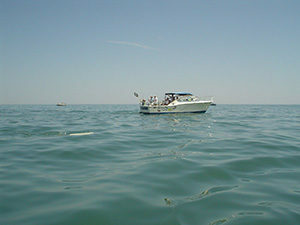 He also said that about 200,000 acres of Lake Superior is restricted to commercial fishing for sports anglers’ benefit. The Wisconsin Natural Resources Board tabled approving an emergency rule last month that would’ve put the agreement into practice. The board’s approval is still pending.